My wife thought we could use a tire swing in the front yard since we have some nice high trees, so she bought some rope for $7 and picked up a free used tire from the local tire shop. She tied the rope to the tire, looped it up around a high branch and tied the other end back to the tire. It was secure and worked. It didn’t seem solid to me, and would present issues when we wanted to take it down for the weekend if we went away. 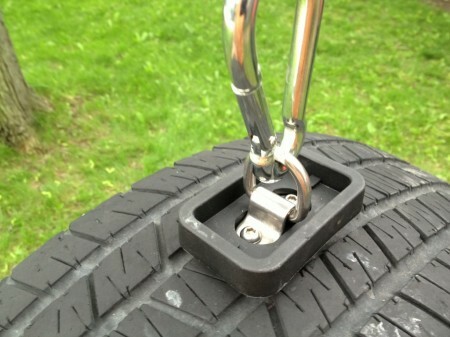 In my mind we should be able to attach a secure loop on the tire and a hook on the rope, to allow easy removal and to keep everything where it should be. I went to a big box hardware store on my lunch and wandered around looking for solutions. Upon locating the rope and wire section I was able to find a large stainless steel carbine hook that was smooth but had a spring latch on one side, for $4. Further wandering in the straps section brought me to a secured loop system for the edges of pickup truck beds: it had a ring surrounded by stiff rubber, secured to a steel plate below with two bolts. They came two in a pack (one for each corner of the truck bed) for $26, but I found an open package that only had one marked down to $6. I was hoping that drilling through the steel belts of the tire and securing the ring bolts would make a secure and durable connection, and it did. Very solid at the outset but only time will tell how it stands up. The rubber box around the loop will hopefully provide a safe buffer around the hardware. Next up was determining how to attach the rope. It seemed like a noose would work best, tightening as weight was applied. 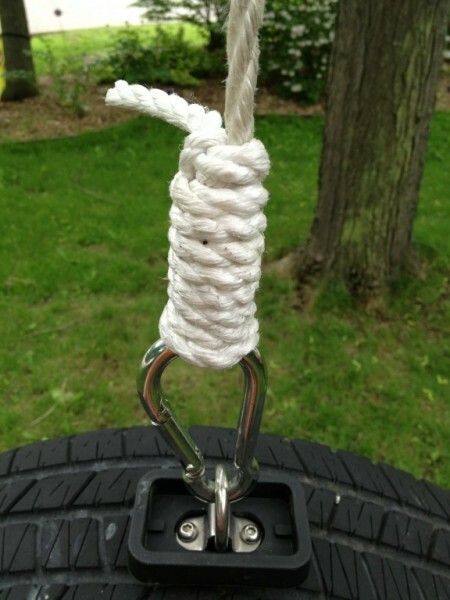 An internet search for “tie a noose” brought up as much information as anyone could want and I was able to tie the noose and have it tighten nicely after my wife volunteered to test it. We realigned the rope around the branch and tied it securely to the trunk. Everything was set and ready for fun. I can assure you tire swing #1 was in no way unsafe! And here are some more fun tire swing pictures.